Napoleon hailed this tart beer style “the Champagne of the North”. A lively and elegant masterpiece this Berliner Weiss is a kaleidoscope of fresh flavor. Barrel fermentation, Pinot Grigio, Riesling grapes and Wisconsin White Wheat are bottle fermented with five proprietary yeast strains. A connoisseur’s rare jewel both spirited and subtle, Enjoy your sparking toast under summer stars. What Carey didn't mention is that one usually drinks a Berliner Weiss mit Schuss or with a shot of syrup. 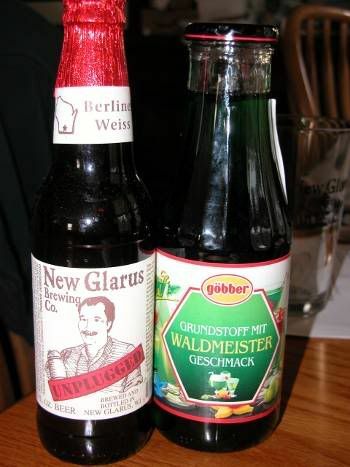 The beer is quite sour and the syrup sweetens it a bit and adds another flavor, generally raspberry (Himbeersirup) or woodruff (Waldmeistersirup). Well, I got my hands on some Waldmeistersirup recently and had me a Berliner Weiss mit Schuss. In my haste for a beer after work, I used a pint glass instead of the customary goblet. Never having used syrup before, I was unsure how much to put in and my beer ended up with a couple tablespoons of it. I suspect that, if I'd have been served one in Germany, I'd have been given a glass with more syrup. 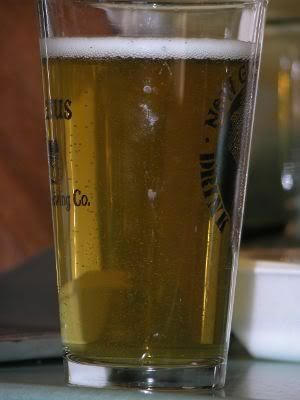 As it was, the beer had a slight green tint and a hint of the earthy woodruff flavor. Despite not having used enough Waldmeistersirup, it was rather tasty. I like sour beer and that flavor was still present with the syrup providing undertones. Tonight I'll drink another but use a goblet and more syrup. I tried again and I think I succeeded. See my latest post on the matter.